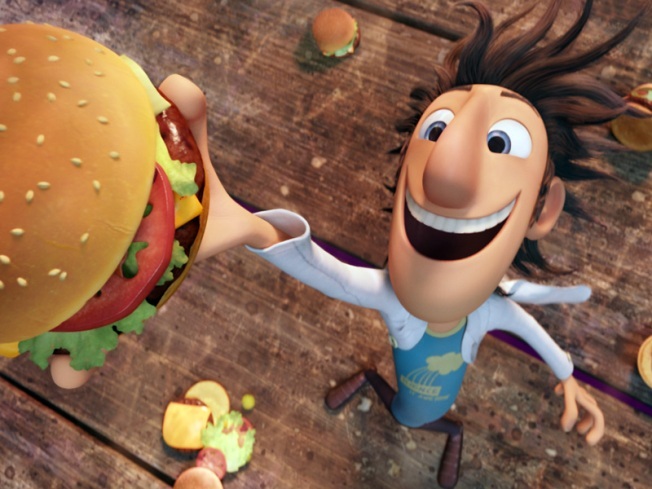 "Flint Lockwood" voiced by Bill Hader in Columbia Pictures' animated film "Cloudy With a Chance of Meatballs." The forecast was bright at the box-office for "Cloudy with a Chance of Meatballs," which earned $30.1 million to lead this weekend's films. Sony's 3-D animated family comedy was adapted from the popular 1978 children's book by Judi and Ron Barrett. Despite schools being back in session, the film still was able to draw kids and their parents to the multiplexes. That's good news for other adaptations of classic children's books on the horizon, namely the much anticipated big screen version of Maurice Sendak's "Where the Wild Things Are." The Spike Jonze directed adaptation will be released Oct. 16. "Itreally does pave the way for a really strong opening for that film," said Hollywood.com box-office analyst Paul Dergarabedian. "It's such a beloved book that the anticipation is really high." Steven Soderbergh's "The Informant!" came in second with $10.5 million, according to studio estimates Sunday. That was slightly better than expected for the Warner Bros. comedy, which stars Matt Damon as a bipolar whistle blower. Last week's box-office topper, Tyler Perry's "I Can Do Bad All By Myself," saw a 57 percent drop for Lionsgate. It still earned $10 million, good enough for third place. That brought its cumulative total to $37.9 million. Jennifer Aniston's "Love Happens" (Universal) came in fourth with $8.5 million, suggesting that audiences may be tiring of the actress in romantic comedies. It's her third film this year. Coming in a distant fifth was "Jennifer's Body," the R-rated horror film written by Diablo Cody, the scribe of "Juno" fame. It earned just $6.8 million for 20th Century Fox. "Jennifer's Body" is viewed most significantly as a test of its star, Megan Fox, to headline a movie. "You always hope for more, but it's a modestly budgeted film that will ultimately be profitable for us," said Chris Aronson, senior vice president of domestic distribution for Fox. Dergarabedian said the number was somewhat low for what looked like "a fan boy's dream," but said the R-rating and niche potential of "Jennifer's Body" wasn't ideal for a coming-out party for the actress. "It may be a matter of just choosing the right projects for her," said Dergarabedian. "She's trying to find a world beyond 'Transformers,' and she will. She's young and has a lot of promise." On the whole, it was an "up" weekend for Hollywood, said Dergarabedian. The weekend's total box-office gross was approximately $100 million, which compares favorably with the $88 million that was made on the corresponding weekend last year. 5. "Jennifer's Body," $6.8 million.